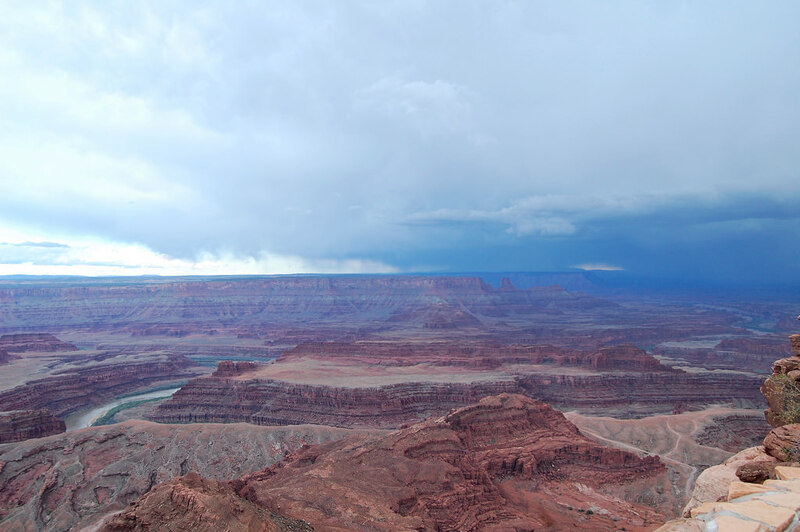 As we departed Canyonlands National Park dark storm clouds rolled in accompanied by lightning. Knowing both Boomer and me, we are scaredy-cats and I contemplated skipping Dead Horse Point State Park because of the lightning. It was going to be a bummer due to the park being dog-friendly and would have allowed Boomer to get out of the car to stretch his legs. Dead Horse State Park is about 9 miles from Canyonlands and in those 9 miles, I went back and forth about 6 times on whether or not I was going to stop at Dead Horse Point State Park. Ultimately I made the decision to stop at Dead Horse. I could see a glimmer of blue skies in the direction of the park so I rolled the dice and we made our way into the park, stopping at the East Rim Trail. The trail system allows pets on the hiking only trails. The hiking trails are shorter in distance and are mostly easy to moderate in difficulty. Dogs are not allowed on the Intrepid Trail System, trails set aside for mountain biking. The story of Dead Horse State Park dates back to the late 1800’s when Cowboys would use the bluffs as a pseudo corral along with some minimal fencing to contain the wild mustangs that roamed the area. The Mustangs would be separated into two groups, breakable and manageable or unable to be broken, called broomtails. A group of broomtails were left on the bluff but the fencing was left open to allow the horses to return to the wild. For some reason, they did not leave the corral and all perished due to thirst. 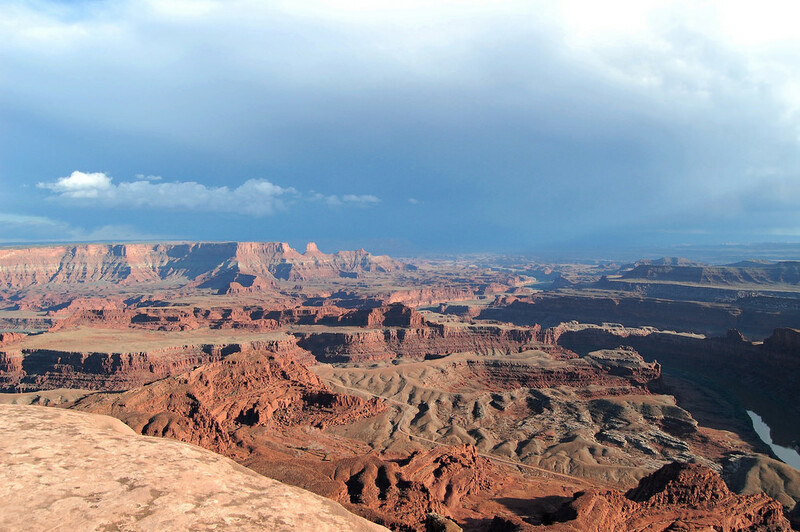 This is how the park got the name Dead Horse Point. 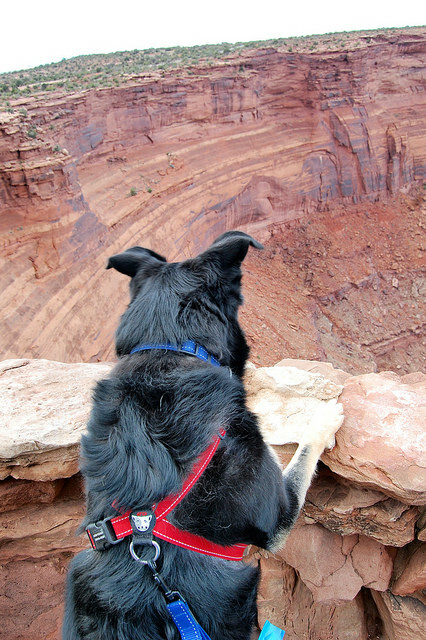 As we reached Dead Horse Point we headed off on the East Rim Trail where I soon found that Boomer was in need of exploring. Boomer has a really bad habit of no fear. Luckily most of the time he is attached to me by a leash but I am not sure he understands that one day he may pull us both over a cliff. I do my best to keep him away from the ledge but he, I think like myself, likes to look over the cliff’s edge. The trail was fairly easy with very little elevation gain. For the most part, the trail was dirt with a few patches of pavement. 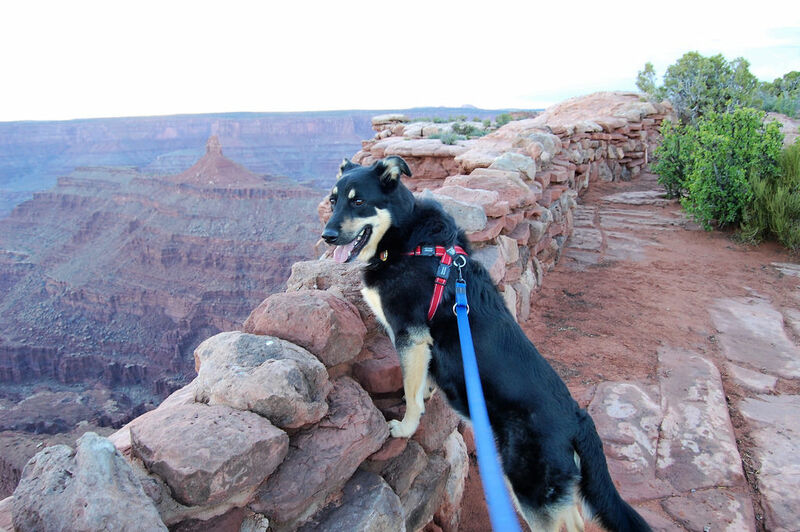 The trail is also lined with a rock retaining wall that helps keep you from the ledge… or if you are Boomer gives you leverage to look out over the basin. The sun was beginning to set and we were not in a rush to get back to the campground. I decided to wait for the sun to go down, finding a spot along the West Rim Trail. It was not the best sunset as there was some haze hanging around from the rainstorm but the low light did add a bit of dramatics to the red rock as the Colorado River snaked its way through the park. 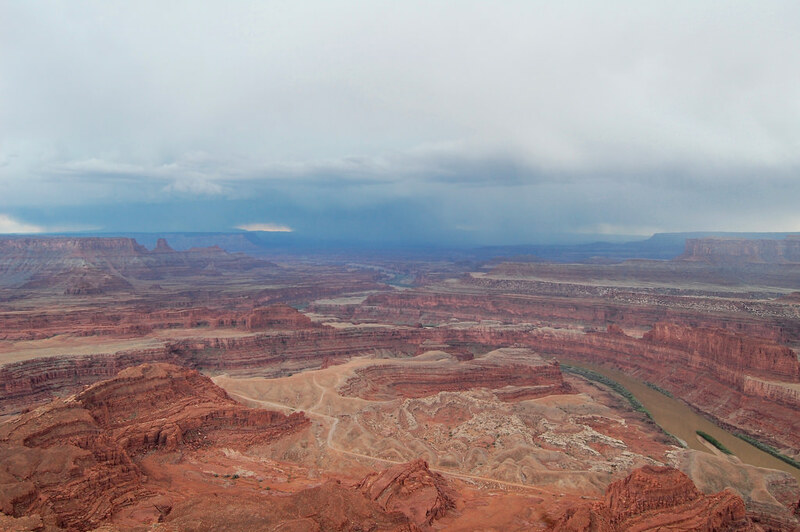 As we left the park we were greeted by more storm clouds and lightning which had me nervous for my next day activity, heading into Arches National Park. Ah, the joys of traveling in the spring time! 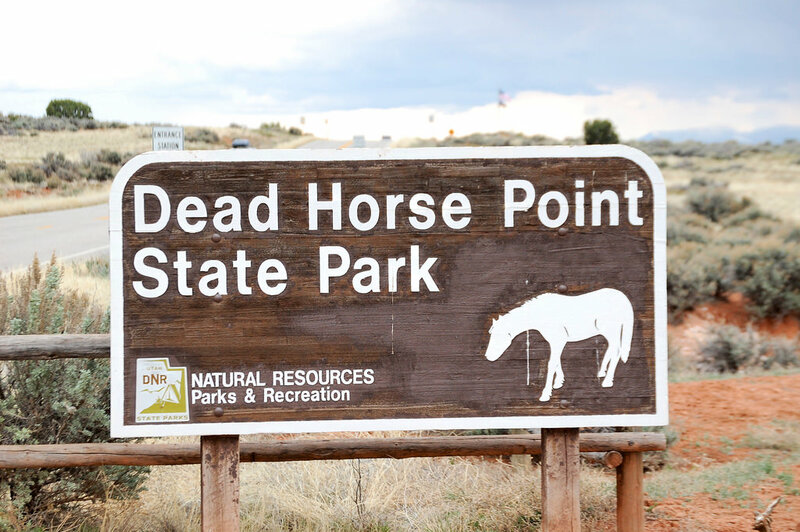 Dead Horse State Park is located 9 miles north of Moab on Highway 191 turning onto Highway 313 for another 23 miles. If you are traveling with a dog and do not have time to stop at both Dead Horse State Park and Canyonlands National Park, Dead Horse is a much better choice. 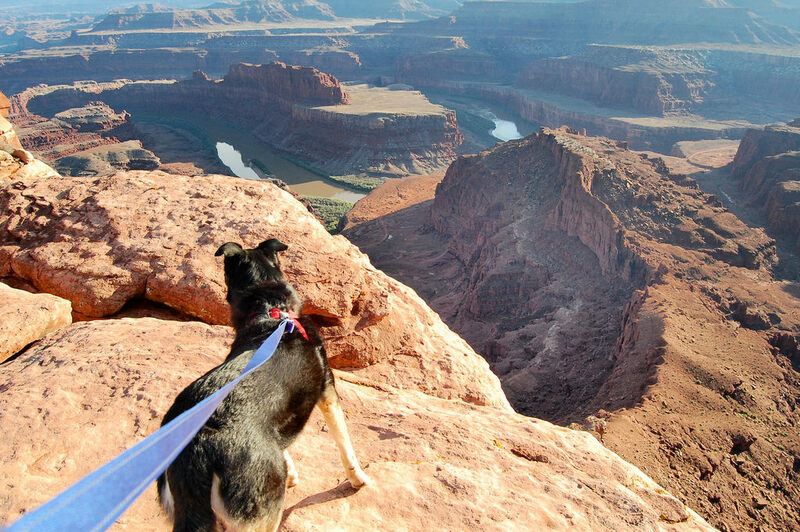 The landscape is similar, if not better and your pet is allowed on most trails where dogs are not allowed on any trails in Canyonlands.